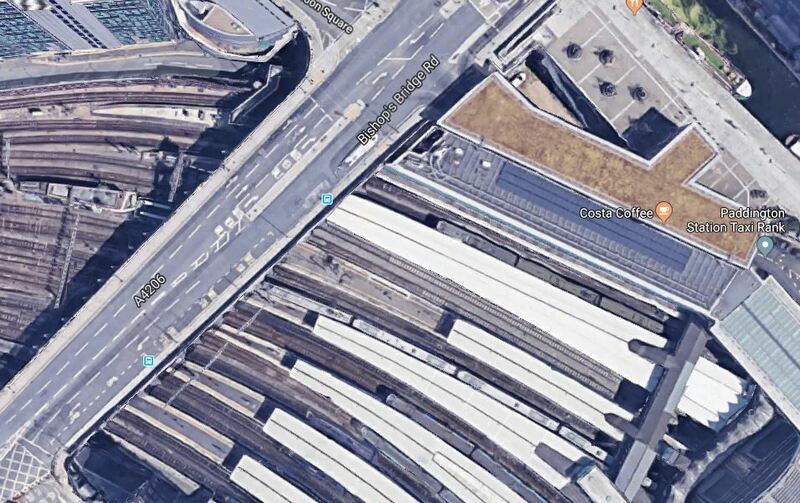 This Google Map shows the Western end of Paddington station. In the top right hand corner of the map you can see the canal boats parked alongside the station. The light brown flat roof, would appear to be the roof of the London Underground station, which has two platforms and is served by the Circle and Hammersmith & City Lines. The thin platform pointing out from under the road bridge at the is probably the extension of the two Underground platforms, which are numbered 15 and 16. The next platform end which is wider, is platforms 12 and 14. Now look at this picture taken by the end barrier on platform 15. The road bridge is over the top. Platform 14 is opposite, which is fitted with overhead electrification. The track for Platform 15, is the Westbound Underground line and has typical London Underground electrification. I think the signal gantry at the end of the platform can be seen on the Google Map. The Google Map and my photo are two different views of the same area. 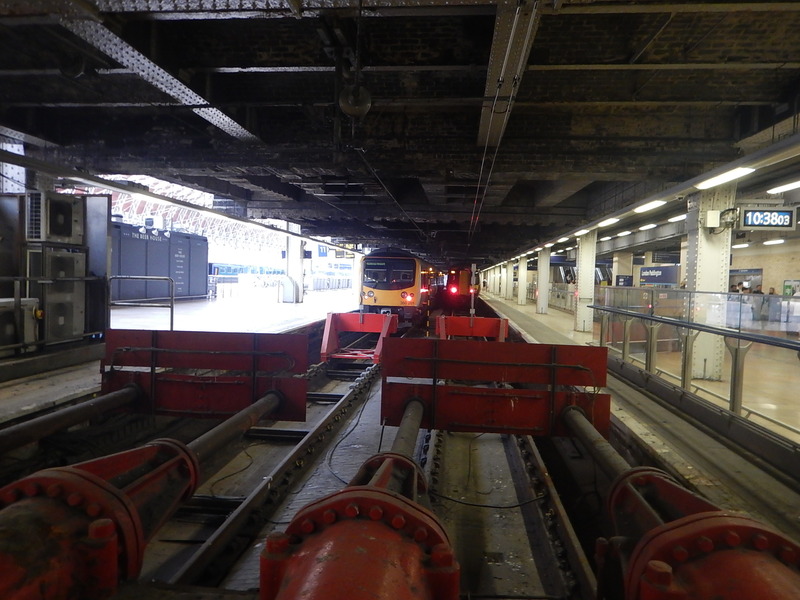 This article on Rail Engineer is entitled All Change At Paddington. This is an extract, which is talking about Platform 14. To extend the platform’s operational length to 164 metres, it had to be extended at both ends. On the London end, the buffer stop had already been moved by 11 metres, and that was all the room available. The country end had also been extended as much as possible. 164 metres is an interesting length. The length of a four-car Class 387 train is just over eighty metres, so two working as a pair would fit Platform 14. In Weight And Dimensions Of A Class 345 Train, I state that the length of a seven-car Class 345 train is 159.74 metres. It looks like platform 14 can accept either of the electric trains that work the suburban services out of Paddington. Platform 12 is the other platform face of the island containing platform 14. I took these pictures as I walked down the Underground platform. I then left the Underground station and took these pictures on the island containing platforms 12 and 14. Note that the train in Platform 12 is an eight-car Class 387 train, which is around 160 metres long. The end of the train appeared to be about the same place as the end barriers on the Eastern end of the Underground platform. As a S7 Stock train is 117.45 metres long, I estimate that the length of Platform 12 is almost 280 metres. This picture was taken at the Eastern End of the platforms from behind the buffers. As there is perhaps forty metres, between the buffer stop and the train, does that mean that Platform 12 and its neighbour; Plstform 11 are long enough to accommodate any of the following. Up to four four-car Class 387 trains. Two seven car Class 345 trains. A Class 345 train at the maximum length of nine or ten cars. Network Rail seem to have provided a lot of space for future services. There is certainly enough space to run a Western Cossrail service to Reading. The space is available now, so it should be available in December 2019. The only restriction would be that Platform 14 can only handle a seven-car Class 345 train. This paragraph outlines the reasons for rejection of HS4Air. But the DfT has reportedly turned down the proposal, primarily over concerns about the affordability and that it would likely face issues because the proposed route will run across greenbelt land. It would appear from the report, that the promoters of the project; Expedition Engineering, are not happy. Lenczner said that most of the rail line was going to be in tunnels, ensuring the impact to open green areas was limited and less than the Lower Thames Crossing. He said: “We’re trying to encourage people to get out of cars and use more sustainable modes of transport and the HS4Air would have contributed to that. “We have had lots of messages of support who are also utterly gobsmacked that it has been rejected at this stage. He added that “we don’t intend to back down,” and said the engineering company plans to challenge the DfT’s decision. Alistair Lenczner is a director of Expedition Engineering. I think that HS4Air proposal is the sort of bold infrastructure project, that we will increasingly need in a post-Brexit world. There were four major proposals to create better rail access to Heathrow up before the Department of Transport. In Could Rail Access To Heathrow Be Formed Of The Best Bits Of Various Schemes?, I summed them all up. I summed up the Heathrow Southern Railway like this. Adds a new route for commuters into Paddington. Extends Crossrail from Heathrow to Staines. It will be built alongside the M25 with a tunnel to Terminal Five. Provides a freight route into the airport from the South West. I summed up HS4Air like this. Possible connection to Gatwick and Ashford for the Continent. North-South station in a tunnel deep under Heathrow. The Heathrow station will be able to handle full-length high speed trains from Birmingham, Cardiff and Manchester. Heathrow could become a High Speed Rail hub serving Greater Western London. All terminals could probably be served, by escalators and lifts from the deep station. Provides a freight route into the airport from the North and West. I’m keener on the section North of Heathrow, than that to the South. I summed up the Western Rail Approach To Heathrow like this. Connectivity to Slough and Reading and further West with a change. Provides a freight route into the airport from the West. I summed up the Windsor Link Railway like this. This scheme also unlocks development of upmarket housing in Windsor. Why Does Heathrow Need Better Rail Access? Heathrow Airport is continuously expanding and needs better transport access. To the man or woman in the Woking 4×4, the baggage handler in his clapped diesel Toyota and the myriad numbers of Air Cargo operators with their polluting trucks, that means better and cheaper parking and more comprehensive road networks at the Airport. We are not talking about an American Airport with masses of space, but an airport with limited land surrounded by housing, office and commercial development. It also has a massive non-aviation pollution footprint, caused by all the diesel vehicles serving the airport. Surely, more and better electric trains and road vehicles into Heathrow should be part of the solution. Most politicians, trade union officials, businessmen and travellers, probably feel so. In the modern world, an ideal airport should be designed so that. All air-side vehicles serving the planes, runways and airport buildings, should be battery-powered or zero carbon. All passengers and airport workers must arrive or leave the airport, by means of electric train, bus, tram or taxi. All supplies and air cargo must arrive and leave the airport by means of electric train or truck. Heathrow will have a large fight to get the Planning Permission for their new runway and expansion plans. But declaring the Airport to be electric vehicle only on the ground, could be a bold move, that could turn the minds of opposing residents, politicians and Local Authorities. This is starting to happen, with even giant electric aircraft tugs for A380s now available. Add up all the numbers of passengers and workers and there isn’t enough capacity at the preset time. There needs to be the following. More frequent and longer trains. HS4Air offered a different approach of a North-South railway through the Airport, which could be built without disturbing the existing rail network at Heathrow. But it has been rejected. HS4Air would also have allowed important local networks to be built onto Crossrail. Adding the West London Orbital Railway to Old Oak Common. I feel that combining the best bits of HS4Air, Heathrow Southern Railway and the West London Orbital Railway could be a good idea, to bring all those important workers to the Airport. Some of the automated-logistics networks used by the likes of Amazon are incredibly impressive. Could a massive logistics hub be built in the centre of the Airport? Electric trains would arrive with pre-loaded containers of air cargo and supplies. The containers would be automatically directed to the appropriate place on a network of tracks deep under the airport. Containers would also travel in the reverse direction with inbound air cargo, returned empties and rubbish. I’m sure something like this will happen and underneath the third runway is surely the place to build such a logistics hub. These are my views on each proposal are as follows. This is probably the second largest and boldest of the four schemes. It gives good connections to large areas of South and South West London. It connects to the two big rail hubs of Waterloo and Charing Cross. It extends Heathrow Express from a short express airport service into a much-needed new commuter route between Surrey and Hampshire and London. It extends Crossrail to Staines to create an important local link into the Airport for the workforce. It could connect to a freight logistics hub under the new third runway. It could be built without affecting existing services. It will probably be a privately-funded scheme. But there is a big disadvantage; there is no connection to Reading, Slough and the West. This is probably the largest and boldest of the four schemes. It connects to High Speed 2 and the Great West Main Line. It could be connected to Gatwick and High Speed One in the future. It would be built mainly in tunnel under Heathrow Airport. It proposes a North South station under Heathrow Airport, below existing rail links. It would be able to handle full-size high speed trains. It would fit in well with the development of a third runway and new terminals, as it will be well below in tunnel. It will probably be a very expensive privately-funded scheme. It does provide good connectivity to Slough, but doesn’t improve the connectivity to other areas, where workers at the Airport will live. I think if this scheme is built, then the following two smaller schemes should be built as well. These schemes would bring in Heathrow’s much-needed workers. I don’t think we’ve heard the last of this scheme. It should provide good connectivity to Reading, Slough and further West. It wouldn’t be difficult to build. Except for Slough, it doesn’t connect to much affordable housing, where Heathrow’s massive workforce live. It is Network Rail’s pet scheme. Would it need to be government-funded? As with HS4Air, I think if this scheme is built, then the following two smaller schemes should be built as well. This is very much a local scheme and doesn’t give enough capacity increase for the Airport. But I don’t rule out in the future, a tunnel under Windsor connecting Slough and Staines to aid the development of the important town. Could a pragmatic approach be taken to give Heathrow, the world-class rail access it needs? This may seem a strange place to start, but I believe that if Heathrow expands, the following will be true. The airport will need large numbers of workers. Not all jobs will be high salaries, so good access to areas of low-cost housing from the airport on a 24/7 basis will be needed. If you work at the airport, then it’ll be the first place from where you want to fly on holiday. Heathrow will not want workers to add to the Airport’s chronic, local pollution footprint. Prime areas for the recruitment of airport workers will be Basingstoke, Bracknell, Reading, Slough, Staines and North West and South London. All currently have bad rail connections to Heathrow. To ease these journeys, the following local connections must be built. In Heathrow Southern Railway’s Plans For Staines, I looked at this extension in detail and came to the conclusion that four trains per hour (tph) could run to and from Staines for Crossrail. Although this extension came about because of the Heathrow Southern Railway proposal, I feel that it should be built whatever scheme is chosen. It will add a capacity of up to 6,000 passengers per hour, between Staines and Heathrow, in both directions. It will increase the capacity of Heathrow Terminal 5 station. It will enable extra Crossrail services between Central London and Heathrow Terminal 5. But the main reason is that it will create a new route between Staines and Abbey Wood via Old Oak Common (for High Speed Two) the West End, Farringdon ( for Thameslink), the City and Canary Wharf. The West London Orbital Railway is planned to run in a circular manner around North West London. I wrote about it in detail in New Railway Line For West London Proposed. Brentford to West Hampstead Thameslink via Old Oak Common. Kew Bridge to Brent Cross via Old Oak Common. The routes would use the freight-only Dudding Hill Line. Up to half-a-dozen new or upgraded stations. A small number of battery-electric Class 710 (?) trains. Crossrail or High Speed Two it is not! The railway will bring large numbers of travellers to Old Oak Common station, where Crossrail will take them to the Airport or Central London. I said I was taking a pragmatic approach to rail access to Heathrow and the Windsor Link Railway build in conjunction with extending Crossrail to Staines could have several advantages. Remove a lot of road traffic from the Centre of Windsor. Create a rail service between Reading and Heathrow via Windsor and Slough. A Park-and-Ride could be built South of Slough by the M4. Unlock land for development in Windsor. One tunnelling project could be used to access Heathrow Terminal 5 station. The route could be run with a frequency of four tph, using Crossrail trains. Perhaps it should even be part of Crossrail? What About The Air Cargo And Supplies? Will Crossrail Open To Reading in 2019? The latest rather dodgy date for the opening of Crossrail’s Core Tunnel is Autumn 2019. In the January 2019 Edition of Modern Railways, there is an article, which is entitled Crossrail Can’t Commit To Autumn Opening. This a paragraph from the article. TfL also says that it is exploring with DfT the possibility of beginning to operate Reading to Paddington services ahead of the completion of the Elizabeth Line to help provide a boost in revenue. This is a very interesting possibility. How Much Work Is Still To Be Done To The West of Hayes & Harlington? This is the key factor as to whether Western Branch of Crossrail can be opened. The biggest problem is that Class 345 trains can’t run to Heathrow as there are signalling issues to eradicate. There are also several stations, that need to be completed. There is no work-round to the first problem, but trains seem to be able to call at the unfinished stations. It would appear, that for TfL’s proposal to be taken fully forward, the signalling issues to and from Heathrow, must be dealt with. The stations can be finished later. These are the proposed services shown on Wikipedia, so they could have been updated. This service will be run at two trains per hour (tph) in the Peak with no trains in the Off-Peak. Stops are Twyford, Maidenhead, Slough, West Drayton and Ealing Broadway. This service will be run at two tph all day. The service will call at all stations except Hanwell and Acton Main Line. 4,2 means 4 tph in the Peak and 2 tph in the Off Peak. It would appear that all stations except Reading and Twyford have at least four tph all day. Stations between Hayes & Harlington and Ealing Broadway will get another six tph all day going to Heathrow. Acton Main Line station will get another four tph all day going to Heathrow. This gives the following frequencies. I can draw these conclusions from the figures. Every station has a good service from Crossrail. But could Reading and Twyford have another two tph in the Off-Peak to make the services four tph all day? Paddington station would need perhaps two or three platforms dedicated to Crossrail to handle twelve tph. The maximum frequency of 12 tph should be easily handled with conventional signalling and could be increased with modern digital signalling. It looks like running the Western services of Crossrail from Paddington could be a possibility. The Reading and Maidenhead services will be run on routes with mainly conventional signalling. The Class 345 trains, which each can hold 1,500 passengers would give a massive capacity boost to the outer Crossrail stations. Heathrow services can be run with Class 345 trains, when the signalling problems are solved. Higher frequencies to and from Paddington may enable trains to provide a better interchange with branch line services, at West Ealing, Slough, Maidenhead and Twyford. But I think that separating these services initially from Crossrail will have substantial operational and development benefits. Paddington to Reading is essentially a self-contained railway, with a major branch to Heathrow and four small branch lines worked by diesel shuttle trains. The route, with the exception of the Heathrow branch, has conventional signalling. The signalling problems of the Heathrow branch can be solved independently. The Western branches of Crossrail could be fully debugged before trains start running through the Core Tunnel. I also wonder, if the route could be useful for mileage accumulation, driver training and certification of newly-delivered trains. The original Modern Railways extract said that the proposal was to help provide TfL with extra revenue. It must bring in revenue and especially when the Heathrow Branch is working reliably to plan. Modern Class 345 trains have the following advantages over the current British Rail-era Class 156 trains. They are modern trains designed for short dwell times at stations. It would be very likely, that journey times between Paddington and Reading, will improve.. But passengers may change their behaviour . Will passengers use Crossrail as a lower-cost alternative to Heathrow Express? Will passengers use Crossrail as a faster alternative to the Piccadilly Line? Will passengers, going between Heathrow and the West and Wales, use Crossrail to and from Reading, with a change at Hayes & Harlingon? Will passengers on branch lines find the extra capacity helpful, when travelling to London or Reading? In addition, as I said earlier, I think opening Paddington to Reading early,, could make finishing the Crossrail project easier. If nothing else, it shortens the to-do list! Will GWR object to losing their local services between Reading and London to Crossrail? GWR have taken over the lucrative Heathrow Express. Heathrow Express will be run using 110 mph Class 387 trains in an Airport Express configuration. Will these trains be less of a block on the line, than the 100 mph Class 332 trains currently running the service? Currently both Class 332 and Class 800 trains take nine 9½ minutes to go between Paddington and Heathrow Airport Junction. Perhaps GWR could squeeze in extra trains, by replacing the Class 332 trains with faster Class 387 trains? The more trains they could squeeze into Paddington, the larger their revenue. I am not sure, but it does appear that GWR services to places like Bedwyn and Oxford will in future be run using the new five-car Class 802 trains. The trains will surely use electric traction on the fast lines to Paddington. Will passengers going between Bedwyn/Oxford and stations between Reading and Paddington, be happy to change at Reading? As it appears that Bedwyn/Oxford services might not need to use the slow lines, these will be used exclusively by Crossrail and the occasional freight. Could Bedwyn And Oxford Services Be Combined? There is also the possibility that to save paths on the fast lines between Reading and Paddington, that hourly Bedwyn and Oxford services could be combined and split at Reading. GWR already splits and joins Class 387 trains at Reading. Class 800/802 trains are designed to be split and joined quickly. Timings to the two destinations are about the same, being around 75 minutes. Two five-car Class 802 trains with one running to Bedwyn and one to Oxford might be a good idea. Especially, as it saves one high-speed path between Paddington and Reading and possibly a few trains. It does look, that Oxford and Bedwyn services could be moved out of the way of Crossrail services. Will There Be Enough Class 800/802 Trains? In Huge Increase In Capacity On GWR As Final Class 800 Enters Traffic, I wrote that there are now only fifteen trains of a total fleet of 93 trains to be delivered. I suspect that GWR can find enough trains to run Bedwyn/Oxford services to London. Too Many Class 387 Trains! But it does strike me that GWR will have too many Class 387 trains, if Crossrail takes over local services to Reading and Class 802 trains take over services to Bedwyn and Oxford. Twelve Class 387 trains are being converted to take over Heathrow Express services, but that still leaves GWR with 33 trains to find a use for. It seems like Greater Anglia’s twenty Class 379 trains, they could become homeless orphans. Will The Class 769 Trains Get In The Way? Original plans talked about using 100 mph Class 769 trains to back up the Class 387 trains, whilst twelve of these were updated to Heathrow Express standard. But it appears now from Wikipedia and other sources on the Internet, that these trains will concentrate on the following services. I can’t find any reference of them continuing to serve Paddington, so it looks like they should keep out of the way. Henley-on-THames station on the Henley Branch Line and Bourne End station on the Marlow Branch Line are having their Peak services to London gradually withdrawn. If Crossrail took over services between Reading and Paddington, the frequencies in the Peak at the interchange stations would be. Two tph at each interchange station run limited stop to and from Paddington. The trains will each hold 1,500 passengers. Could it be that GWR feel that the increased frequencies and reduced journey times to and from Paddington mean that there is a lesser need to run a direct diesel service. But I could see the following. A four-car shuttle train, which could be a Class 769 bi-mode, at two tph on the Henley Branch Line. Two tph on the Marlow Branch Line. At least GWR have the trains to provide a service to match customer demand. I also wouldn’t be surprised to see a radical plan for these branches. Every train run by GWR and Crossrail, between Paddington and Reading, would use electric traction. Now that large numbers of Class 800/802 trains have been delivered, it can’t be long before the last InterCity 125 runs into Paddington on a regular service. Class 165 and Class 166 diesel trains will be refurbished and sent to the West Country. Bedwyn and Oxford services will be run by Class 800/802 trains. In addition all GWR trains running into Paddington will be 125 mph units running on electricity. What is that worth as a marketing hook? It looks to me, that running a full Western Branch service for Crossrail could be a good move. So will it happen in 2019? I think it all depends on solving the signalling issues on the Heathrow Branch! But I feel, it should be possible, otherwise TfL wouldn’t have suggested it! The title of this post is the same as that of an article in Edition 865 of Rail Magazine. 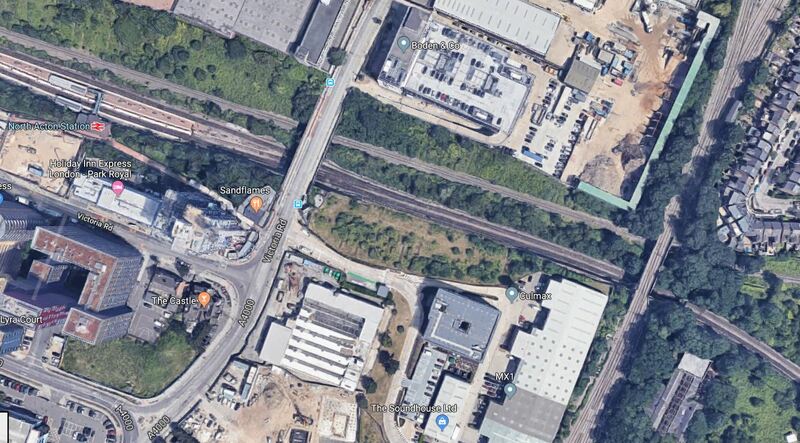 Hounslow Borough Council is considering an application by South Western Railway to build a new depot on the site of Feltham’s former marshalling yard in South West London. It appears to be remarkably clear and the only clue to its former use must be Feltham Railway Club. The depot will lie between Feltham and Whitton stations on the Southern side of the Waterloo-Reading Line. The depot will have ten roads and will be able to accommodate ten car trains. Construction will start in February 2019 and the depot will open in 2020. There houldn’t appear to be too many construction problems. Would The Opportunity Be Taken To Upgrade The Waterloo-Reading Line? Waterloo to Reading and Windsor services might be increased in frequency. Could an extra track be added alongside the depot or other works be performed to add capacity to services Reading and Windsor? What Will Be The Affects Of The Proposed Heathrow Southern Railway? The Heathrow Southern Railway is a proposal for a new route between Waterloo and Heathrow Airport via Clapham Junction and Staines. Should Level Crossings In The Area Be Closed? There are level crossings at Barnes, Feltham, Isleworth, Mortlake and North Sheen. Would The Land Be Better Used For Housing? This could be the major objection from the Council. They could always build a depot with housing on top. Could A Bigger Feltham Station Be built At The Same Time? This could be a possibility, with perhaps a turnback platform for the proposed West London Orbital Railway. Building the depot seems a good and fairly simple plan, but willit cover all possibilities? I wanted to ride the Greenford Branch to photograph a Class 165 train in the livery of Great Western Railway. So I took one of TfL Rail’s Class 345 trains to West Ealing station. By the time, that I’d climbed over the bridge and walked to Platform 5 to catch the Class 165 train to Greenford, the train had just left. So I then spent a miserably cold thirty minutes in a fierce wind on a station without a shelter, whilst I waited for the next train. In that time, when I took these pictures, two passenger trains in each direction stopped in the station. When Crossrail finally opens, West Ealing station is going to get ten trains per hour (tph) in both directions, which will terminate in the West at Heathrow Terminal 4, Heathrow Terminal 5, Maidenhead and Reading. Passengers interchanging with the Greenford Branch will enjoy the thirty minute wait. I have been told several times by train staff and airport workers that getting to Heathrow Airport somtimes needs a car, as the buses are hard to find. Nothing has been said about Crossrail running through the night, but as Thameslink runs to Gatwick, I wouls suspect this will happen. And if Crossrail runs through the night, surely the humble Greenford Branch should do the same. Plans should be developed to get the Greenford Branch running at four tph, throughout the day and perhaps two tph, when Crossrail is running through the night. Spelthorne Borough Council has submitted proposals for a light rail link from Staines-upon-Thames to Heathrow airport to provide “joined-up journeys” into the airport from the south. The light rail link would run from close to Stains station to the Heathrow, every six minutes and take just seven minutes. Based on trams, the same size as the Midland Metro, it would provide a capacity of 2100 passengers per hour to and from the Airport. In Could Rail Access To Heathrow Be Formed Of The Best Bits Of Various Schemes?, I noted four main uses for transport to Heathrow Airport. Spelthorne’s plan only serves a very limited market of passengers and workers living in Staines, who need to go to the Airport. If you have a direct train or bus, would you go to Staines and change to a tram? No way! The plan does nothing to get polluting trucks off the road, although it might be a vote winner in Spelthorne. I question whether Spelthorne have read the plans for Heathrow Southern Railway (HSR), which I first heard about in the December 2016 Edition of Modern Railways. I wrote about HSR, Crossrail and Staines in Heathrow Southern Railway’s Plans For Staines. This link would do the following. Provide up to six trains per hour (tph) between Staines all Heathrow stations, HS2 and Central London. Transport passengers to Paddington in less time, than it takes to get to Waterloo at present. Use Class 345 train with a capacity of 1500 passengers. Give nearly three times the capacity of a light rail system with four tph. Give over four times the capacity of a light rail system with six tph. Allow passengers between Staines and the Airport would also be able to use services between Heathrow and Waterloo. Need perhaps a couple of extra trains for the Staines extension of Crossrail. I have no costings for the addition of the extra platform at Staines station, but I suspect that it is less than £375million. If Heathrow Southern Railway is built, Spelthorne’s plan would be as dead as a dodo. I see no future in Spelthorne’s light-rail plan, so it should be buried now before it costs taxpayers more money. This news item on the Heathrow Southern Railway web site is entitled Plans Announced For £1 billion Rail Link Between Southampton And Heathrow. That is the message from Graham Cross, chief executive of Heathrow Southern Railway (HSR), which is preparing plans for a £1 billion rail link between the city and the UK’s biggest airport. 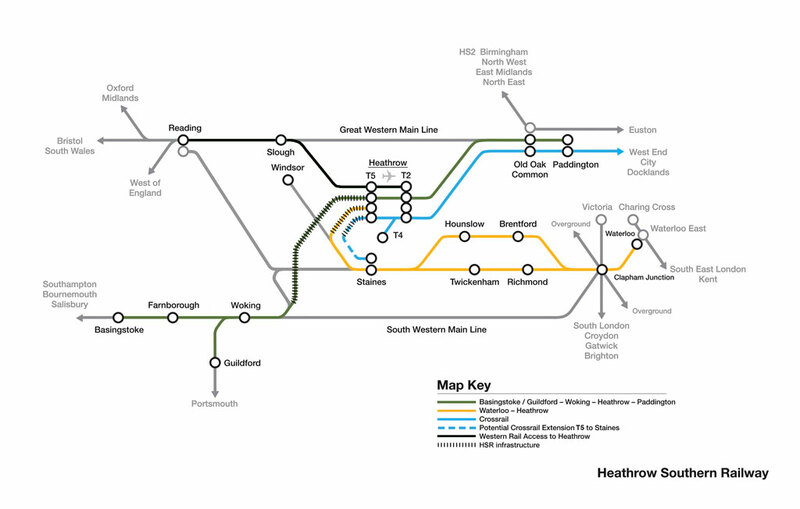 This map shows a schematic of the Heathrow Southern Railway. Hethrow Southern Railway’s plans are as follows. 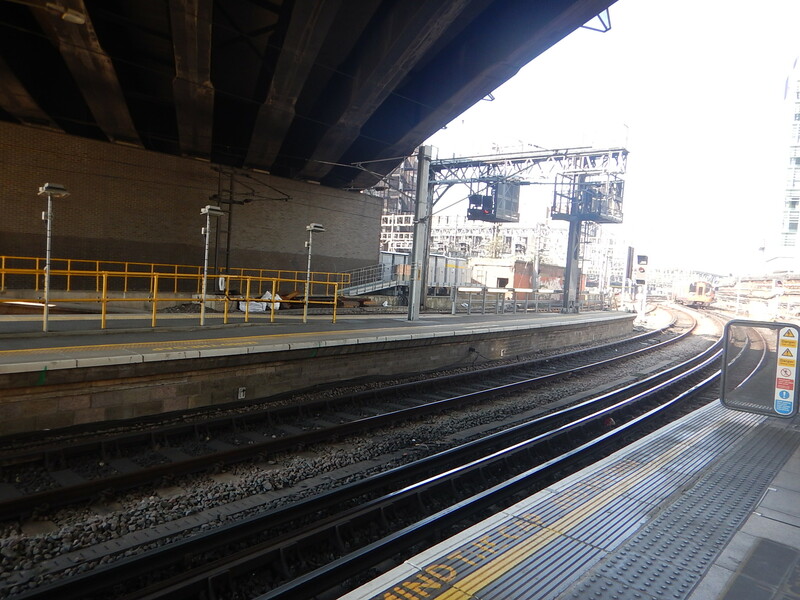 A new section of railway will connect the Chertsey Branch Line to Heathrow Terminal 5 station. This new section of railway will be built alongside the M25 to minimise environmental disruption. From there trains will call at Heathrow Central and Old Oak Common stations before terminating at Paddington station. Trains will connect Heathrow to Woking station and on to Basingstoke and Guildford. Currently, the service between Southampton Central and London is as follows. If we take Graham Cross at his word, that the following frequencies to various stations. Passengers from Southampton.Bournemouth, Poole and Weymouth would have a much larger choice of London stations. As Heathrow Southern Railway also plan to run two tph between Paddington and Guildford via Heathrow, Woking could become a busier place. These pictures show Woking station. Note some of the characteristics. The station has four long through platforms, which can accommodate the longest ten-car trains used by South Western Railway. Two five-car Class 444 trains are 230 metres long, when running as a ten-car train. If Heathrow Southern Railway want to run Class 387 trains, train lengths will be as follows. Twelve-cars trains may be too long for the platforms at Woking and other stations. but as Heathrow Southern Railway won’t open for a few years, I wouldn’t be surprised to see new trains used by Heathrow Express and Heathrow Southern Railway. I also think, that these platforms are ideal for pairs to join and split here, so that trains are say tencars between Woking and Paddington via Heathrow and Old Oak Common and five cars to the South West of Woking. Woking’s long platforms will be used to great advantage by Heathrow Southern Railway to match their services to the capacity needed. For passengers and workers to and from Heathrow Airport. For passengers to and from HS2 at Old Oak Common. Heathrow Southern Railway will do a lot more, than just provide Southern access to Heathrow. There is a shorter bay platform at the London end of the station, which is currently used for stopping trains to London. It can’t handle long trains like the through platforms and for this reason along, I doubt it will be used by services to Heathrow. But I wouldn’t be surprised to see a second bay platform added to improve capacity. Wikipedia says this about Plstform 6, which is a short by platform facing West. The first train of the day to Portsmouth Harbour via Eastleigh starts from this platform, and it is often used to stable diesel locomotives in the event of a train failure. It is probably best filed under operationally useful and I doubt it will be used by Heathrow Southern Railway, as it faces away from Heathrow. In the pictures, you can see tower blocks rising all round the station. There will obviously be more, even if as I suspect the local residents object. But we do need more housing in this crowded country of ours and Woking is a convenient distance from London for commuters. Should Tracks At Woking Station Be Remodelled? After Heathrow Southern Railway opens, trains calling at Woking station will use the following routes towards London. Via Clapham Junction to Waterloo. And the following routes away from London. Via Basingstoke to Bournemouth, Exeter, Poole, Salisbury, Southampton and Weymouth. An ideal layout might be two wide island platforms, as they have at Reading stations. The platforms are connected to a wide overbridge with coffee kiosks and useful shops, by escalators and lifts. 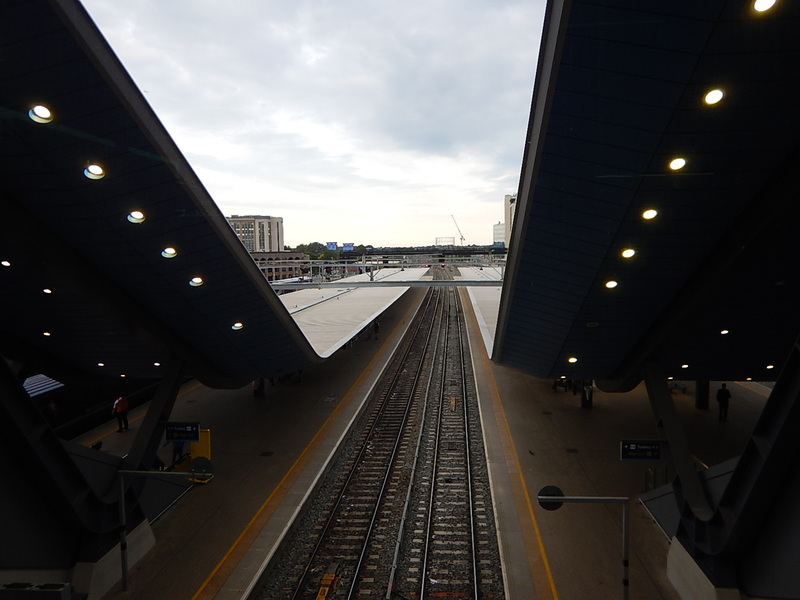 The picture shows the wide open spaces of the overbridge at Reading on the day it opened. At Reading passengers can change trains, by waiting on the platform or sitting on the overbridge. Would a similar design work at Woking? Certainly something designed on similar principles to fit the circumstances of Woking station would! Reading incidentally manages at least six tph on each face of the wide island platforms. They are able to do this because. The platforms are very wide. Trains are increasingly Class 800 trains with modern doors. There are both up and down escalators. I suspect, that when InterCity 125 trains no longer call at Reading and all trains are using modern in-cab signalling, that the frequencies of train through Reading will rise significantly. 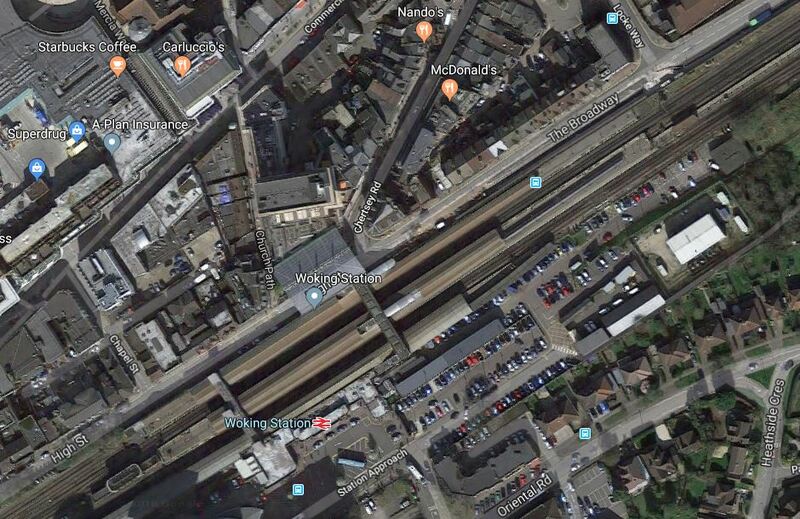 To the West of Woking station, where the routes to Guildford and Basingstoke divide, there is a lot of space and if required a flyover or dive-under could be built to minimise the need for flat junctions. West Byfleet and Byfleet & New Haw stations are between Woking station and Byfleet Junction, where Heathrow and Waterloo services will divide. This map from carto.metro.free.fr shows Byfleet & New Haw station and Byfleet Junction. There is only four tracks between Byfleet junction. Byfleet junction connects to the slow lines. Crossovers connect the slow and fast lines. This layout means that fast trains coming from Heathrow will have to go through the slow platform at Byfleet & New Haw station. There are two ways to increase safety. Increase the number of tracks between Woking station and Byfleet Junction to six, with dedicated tracks for Heathrow services. Rebuild the platforms on the two intermediate stations to the design rules in Two Platform Stations With 125 mph Trains. It all depends, whether Heathrow Southern Railway want to use 125 mph trains on their services to Heathrow! I discussed this in Will Heathrow Southern Railway Use Trains Capable Of 125 mph?, where I came the conclusion that the railway will be built to that standard. Will Woking Station Be Rebuilt? To work efficiently, as a railway station, I very much feel that Woking station will be rebuilt. As at Reading, this will probably be done without too much disruption to passengers and trains. It is quite a large station site and I wonder, if the ideal solution would be to build a concrete deck over the station and railway and put developments like housing, offices, shops, cafes and green spaces over the top. Why shouldn’t we create more land for useful purposes? The station could have a massive concourse. Wide lines of gates on either side would give quick access to the Town Centre and the Car Parking. Useful shops and cafes would be on the concourse. The new station should be designed to allow up to 24 tph, through the station. Perhaps it would be sensible to design fora capacity of 12 tph on all branches. With modern signalling and perhaps a degree of automatic train control, these frequencies shouldn’t be a problem. Wide platforms, that allow passengers to change trains, by just getting off one train and onto another a few minutes later are an essential. A double-faced island platform could be used or a single wide platform in each direction as on Thameslink at St. Pancras station. The platforms at St. Pancras work reasonably well and have been designed to handle 24 tph. Passenger information displays are magnitudes better than most stations. There are Harrington Humps for step-free access to the Class 700 trains. Only one class of train uses the platforms. Modern digtal signalling is used. Passengers use the station to change trains, when perhaps they are on a train going to one direction and need another. To complicate matters at St.Pancras, there is a flat junction to the North of the station, where services go to and from the Midland Main and East Coast Main Lines. It appears the junction causes no delays to services. So perhaps at Woking we could see one very wide platform in each direction. I’m sure that Network Rail and their architects can use the experience gained at other stations in the UK to create an interchange station at Woking, that is fit for the 21st Century. Will Heathrow Southern Railway Use Trains Capable Of 125 mph? If the Heathrow Southern Railway is built, by the time it opens, there will have been significant developments. Digital signalling based on ERTMS, with the possibilities of a degree of automatic control will be commonplace. Train manufacturers will offer 125 mph trains, that with the right interiors will be able to perform well on 100 mph routes with frequent stops. 125 mph bi-mode trains will have arrived. Great Western Railway services into Paddington, with the exception of local services will be run by 125 mph Class 800 trains. The opening of Old Oak Common station with its connections to High Speed Two, may mean that some Great Western Railway services stop at that station. These developments may mean that on the Western end of the Great Western Main Line, there will be a need for a train with a lot of acceleration, to avoid inducing delays in the complex schedule of trains serving Paddington and Old Oak Common stations. The easy way to achieve the required acceleration, may be to use more powerful trains, which will probably be capable of 125 mph. But would they offer advantages over other parts of the routes Heathrow Southern Railway will serve? The following must be considered. Currently, the Class 395 train, is the fastest train fitted with third rail shoes. But the train only has a top speed of 100 mph, when on lines electrified using third-rail electrification. The world record for a train powered by third-rail electrification was set by a Class 442 train at 108 mph. As several trains in the UK can cruise at 125 mph, could it be that the dynamics of third-rail electrification impose a limit to top speed? In Mathematics Of A Bi-Mode Aventra With Batteries, I analyse the train in detail. My calculation might be wrong, but it’s in the right area. Using batteries with third-rail electric trains, may be an alternative way to overcome any problems with the dynamics of that method of electrification. But I do suspect that if train manufacturers were asked to produce an electric train capable of running at 125 mph using third-rail electrification, they would take the money and build the trains. The South Western Main Line to Southampton, Bournemouth, Poole and Weymouth has a 100 mph operating speed. The Portsmouth Diect Line to Guildford and Portsmouth has a 90 mph maximum speed. South Western Railway know that speed on these routes sells tickets, so much so that they are refurbishing the Class 442 trains for the Portsmouth route because of their higher performance. Network Rail may get a lot of criticism for their performance with electrification, which work on new track layouts and improvements,seems not to attract. They have also been very successful in designing and executing 125 mph track upgrades to the Midland Main Line. So would it be possible to upgrade some of the routes to allow faster running? Fifty miles of line upgraded from 100 mph to 125 mph running saves six minutes. Waterloo to Weymouth is 143 miles. More powerful trains might save time on station stops. The routes are four tracks to Basingstoke. As modern digital signalling is applied to this route there will be further time savings. At the moment there is no point, as South Western Railway only has trains with an operating speed of 100 mph. But these trains will probably be replaced in the next few years or so and I wouldn’t be surprised to see them replaced with trains that are capable of 125 mph, which would make updating sections to the West of Woking possible. Surely faster services to Bournemouth, Poole, Portsmouth, Southampton and Weymouth will be of interest to South Western Railway, even if it means new trains. Heathrow Southern Railway intends to build a new route between Heathrow Terminal 5 and Working stations. A tunnel will connect the Western end of Heathrow Terminal 5 station to new tracks running alongside the M25 to connect to the Chertsey Branch Line to the West of Chertsey station. Trains would pass through Chertsey and Addlestone stations, before joining the South Western Main Line at Byfleet Junction. 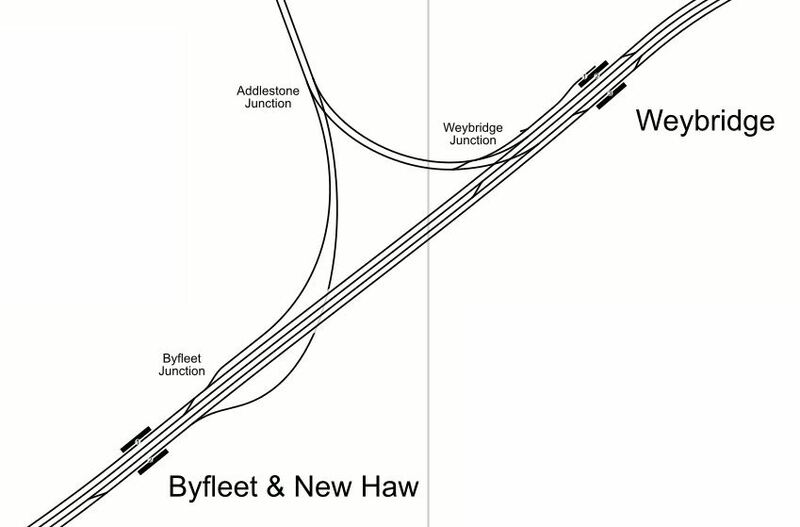 Trains would pass through West Byfleet and Byfleet & New Haw stations to reach Woking station. It is a well-designed route, that uses the M25 to minimise environmental damage. From what I have said earlier about 125 mph third-rail trains, upgrading of routes to 125 mph and South Western Railways desire for faster services, I can see no reason, why this route shouldn’t be built for 125 mph operation. 125 mph trains would mean. Removing level crossings at Chertsey and Addlestone stations. Upgrading West Byfleet and Byfleet & New Haw stations. Probably upgrading between Byfleet Junction and Woking station for 125 mph running. But there would be about fifteen miles of high speed rail line, which for ease of operation would probably be electrified with third-rail. Trains would switch electrification systems in Heathrow Terminal 5 station. 125 mph third-rail trains will become a reality. South Western Railway and Heathrow Southern Railway will look at them seriously. I also feel that Heathrow Southern Railway will be a 125 mph railway. Could Rail Access To Heathrow Be Formed Of The Best Bits Of Various Schemes? Various schemes have been proposed to improve rail access to Heathrow. There are also two schemes in progress, that will improve rail access to Heathrow. Crossrail, which will open in 2019. Piccadilly Line Upgrade, which will be complete in 2025. I also believe that if the West London Orbital Railway is created, then this could have a positive affect on travelling to and from Heathrow. Heathrow are disclosing a master plan, for rebuilding a lot of the airport to make it more efficient and up with the best. There will be two main terminals; Heathrow West and Heathrow East with satellites in between handling the actual planes. These two terminals and the satellites will be between the two existing runways, with a passenger and baggage transport system beneath. Terminal Five will become Heathrow West. An extended Terminal Two will become Heathrow East. Crossrail, Heathrow Express and the Underground will serve both main terminals. I believe that this rebuilding will happen, whether or not a third runway is built and it could start in the next few years. Heathrow is a big polluter, but it is not so much the planes, as the diesel cars, buses and trucks serving the airport. There are several uses for improved rail access to Heathrow. Many passengers feel they must drive to and from Heathrow. Next year, Crossrail will connect Heathrow directly to the City of London, Canary Wharf, the West End and to the heart of London’s Underground, Overground and National Rail system. An example journey will be Bond Street to Heathrow Central in twenty-six minutes. New trains on the Piccadilly Line are planned to enter service in 2023 and will offer more capacity and more pleasant journeys. Currently, Piccadlly Circus to Heathrow Central takes fifty-two minutes and I would hope that this time is reduced to perhaps 40-45 minutes. I think, these two upgrades will change the way many in Central, North East, East and South East London access the airport. Trains will be more comfortable. Crossrail will be completely step-free. The Piccadilly Line will have more step-free stations. The Crossrail trains will have masses of space. But Crossrail and the Piccxadilly Line upgrade, will do little for those in North West and South West London and those living to the West of the airport. Workers at Heathrow, range from highly-paid pilots down to lowly-paid cleaners, with a full spectrum in between. Many though have a problem, in that they need to get to and from the airport at times, that are inconvenient for public transport. A station guy at Staines said that getting between there and Heathrow for an early start or after a late finish is difficult. The lower-paid workers also need good links to areas of lower-cost housing. In an ideal world, Crossrail and Piccadilly Line services, should run on a twenty-four hour basis, with appropriate frequencies. I wonder what percentage of the supplies for Heathrow is brought in by diesel truck. In the Heathrow of the Future, surely many supplies could be loaded onto smart trolleys and taken on electric freight trains to delivery points under the airport. Heathrow is an important air cargo terminal, but as with supplies, surely the cargo can be collected outside of the airport and delivered by electric shuttle trains. Connectivity to large parts of London and the East. Connectivity to lower-cost housing areas in East and West London. Extra trains could be added. The capability for 24 hour operation has hopefully been built in. Probably needs 24 hour operation. Connectivity to North West London with a change at Old Oak Common. Connectivity to low-cost hosting areas in West London. Created as part of the Overground. Eight trains per hour (tph) through Old Oak Common. Connectivity for high-value passengers in affluent parts of North London. Connectivity for important workers in less-affluent parts of North West London. Probably, Transport for London funded. The West London Orbital Railway should go ahead, because it connects so much of West London to Crossrail, Old Oak Common and High Speed Two. I have seen railway stations and airports all over Europe. Many airport stations are cramped, as they have been built as an afterthought. But some like Schipol and Frankfurt have a comprehensive station, where you can get trains to a very long list of places without a change. Heathrow needs a very high level of connectivity, for passengers, workers and freight. Heathrow Southern Railway, which extends Heathrow Express to the South West and provides links to Waterloo and Greater South London. HS4Air, which has an elegant expandable station deep under the airport and connects to High Speed Two and the Great Western Railway in the North. Extending to Gatwick and Ashford for the Continent could also be possible, if required. Western Rail Approach To Heathrow only does what it says in the name and HS4Air does that without bagging valuable platforms at Terminal Five. Heathrow’s other big need is rail access for the increasing numbers of people, who work at the airport and live locally. Heathrow Southern Railway links the airport to South West London and also allows an extension of Crossrail to Staines. Windsor Link Railway links the airport to Windsor, Slough and Reading. Crossrail links the airport to Old Oak Common with its housing developments and rail connections with High Speed 2 and the London Overground. West London Orbital Railway will bring more workers and passengers to Old Oak Common from all over North West and South West London. Old Oak Common will be important for many working at the airport. 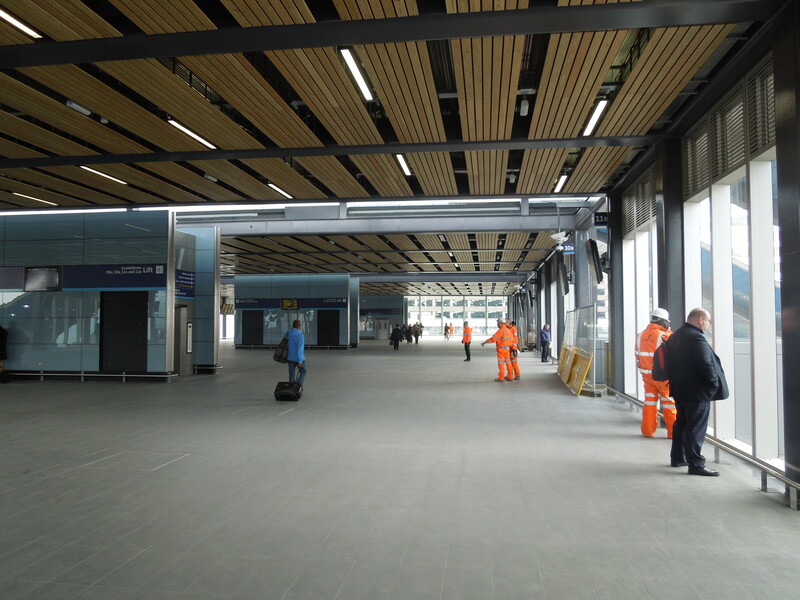 Old Oak Common station will become an important interchange for workers and passengers travelling to and from Heathrow. It must be totally step-free. Some of the long interchange walks on current plans should be augmented by travelators. Crossrail is planning six tph between Old Oak Common and Heathrow. Is that enough? Get Old Oak Common right and all those needing to go to and from Heathrow will benefit. The connection between Heathrow and Gatwick airports is tortuous at present, but will get better as the years progress, as Crossrail and Thameslink improve. As the airports grow, with a third runway at Heathrow and a second one at Gatwick, how many people will want to travel quickly between the two airports, as increasingly, both airports will offer services to more destinations? As a Londoner, I also believe that we will see more split flights, where passengers stopover in London for a night or two, when they are going halfway around the world. Terminal London will be the best airport transfer terminal in the world. Predicting the number of travellers between the two airports will be extremely difficult and only a direct measurement will be a worthwhile figure. If a direct rail link is needed, HS4Air should be extended to Gatwick to provide a frequent fifteen minute connection. I will be very surprised if many travellers need to go quickly between Heathrow and High Speed One. Why would anybody between say St. louis and Paris not fly direct? Perhaps only, if you were spending time in London between the two legs of your journey. For those that need to do it, using an extended Crossrail between Heathrow and Ebbsfleet will probably be good enough. But when passenger numbers say it would be viable, extending HS4Air to Ashford would be a distinct possibility. For all sorts of reasons Heathrow needs good connectivity to High Speed Two. If I was the CEO of Heathrow, I would want to have a station at my airport, where passengers could travel to and from the major cities of Birmingham, Leeds, Liverpool, Manchester, Newcastle and Nottingham in as direct a manner as possible. Using Crossrail to Old Oak Common will give access to all High Speed Two trains, but the ability to get a train to the North within thirty minutes of clearing immigration and customs, would be a major selling point for my airport. Suppose HS4Air was providing four tph to Birmingham of which two tph, went to each of Crewe/Manchester and Nottingham/Leeds. Or the four tph could be double trains, with one half serving each Northern route. This would make Heathrow a viable alternative to regional airports. Heathrow will strongly support HS4Air, as it would be like having a whole series of regional flights, with a thirty minute transfer to and from long-haul routes. The Western Rail Approach To Heathrow is far inferior to the HS4Air proposal. The Western Rail Approach To Heathrow only connects the Great Western Railway to Heathrow. HS4Air connects High Speed Two as well. HS4Air creates a new expandable station under the airport, which would be capable of handling the longest trains. HS4Air can be expanded to Gatwick and Ashford. Direct access between Slough and Heathrow can be provided by the Windsor Link Railway. All these schemes have their good points and I think that the best way to get the rail access that Heathrow and Gatwick need, is to let the private section build what the airports need, subject to the correct planning permissions.